In Canada the word “college” usually applies to a community college, polytechnic, or other 2-year post-secondary institution. “University” is used for the degree-granting institutions. A student at the University of Waterloo or Toronto would never refer to themselves as a “college student”, for example. In the U.S., terms like “college admissions” or “college students” seem to be more broadly defined, including universities. However, to confuse things further some universities in Canada have “colleges” within them as academic communities, similar to the way that Oxford University has Magdalen College and others. Canadian universities tend to focus on Grade 12 results (and maybe Grade 11 to a limited extent). They will look at SAT and ACT scores if provided, but they are not usually required (except maybe for some international applicants). U.S. universities seem to use cumulative GPA (Grades 9 through 11 or 12) and usually require SAT or ACT scores from everyone (although this is a broad generalization). In Canada (or at least in Ontario), the application due dates are generally in the January to February time frame, with decisions coming out by early May, and offer acceptances due in early June. The U.S. process seems to start earlier (around November?) and requires offer acceptances by May 1 in many cases. The terms “freshman, sophomore, junior, senior” commonly used in the U.S. are rarely heard in Canada. We usually refer to first-year (sometimes “frosh”), 2nd, 3rd, and 4th year university students. A high school calculus course is an admission requirement for many Canadian engineering programs, and is a normal part of Grade 12 high school curricula in many provinces. U.S. universities don’t seem to require this for admission, and teach introductory calculus in their programs. Canadian engineering programs can be accredited by the Canadian Engineering Accreditation Board (CEAB). U.S. programs can be accredited by the Accreditation Board for Engineering and Technology (ABET). CEAB and ABET requirements are sufficiently harmonized that engineering licensing bodies in North America will usually recognize either one. So graduating from Canada and being licensed in the U.S. is quite feasible, and vice versa. The Greek lettered fraternities and sororities you read about in U.S. colleges are virtually unknown in Canada. A few exist here and there (I think there is still one in Waterloo, but it’s not on-campus). Being a member of a fraternity has no particular significance to most employers and others in Canada. Canadian engineering programs are generally direct entry, meaning that you apply to engineering and start in the program right away. Transfers into engineering may be possible, but most students start there. This is also the case in some U.S. colleges, but there seem to be quite a few where you start in a general science program and declare an engineering major in 2nd year, if desired. In Canada, information about applicants’ and students’ race is not collected (and therefore not reported), and is not any part of the admission decision process. U.S. colleges seem to always report this, so possibly it’s a state or federal legal requirement? I don’t know much about it beyond that. 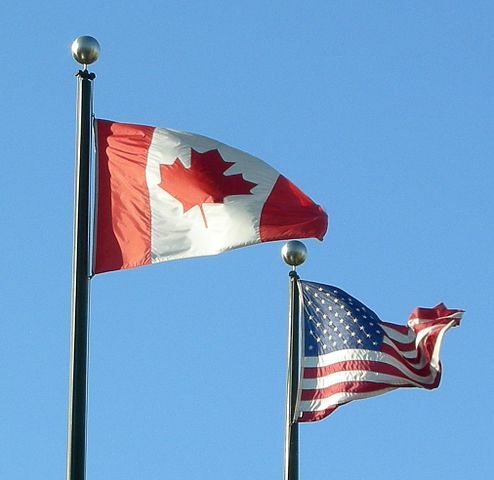 There are subtle differences between Canadian and American-raised people. An obvious one you will notice in print and on signs is spelling of certain words. Canadians tend to use British spellings, although not entirely. So we use “theatre” instead of the American “theater” (which has the added advantage of being bilingual, since the French word is “théâtre”). Other examples are are “honour” versus “honor”. Likewise the letter “z” is referred to as “zed” by Canadians (anglo and francophones), versus “zee” by Americans. Another distinction I’ve run across is the Canadian pronunciation of the word “process”, usually “pr-oh-cess”, versus the American “pr-ah-cess”. So those are a few differences, in no particular order. There are probably a number of others that I haven’t thought of at the moment. But hopefully those were interesting, especially to international readers including Americans who inquire about studying in Canada. As a Canadian Waterloo Engineering alumnus living and working in the United States for the last seven years, albeit not in an engineering role, with two teenagers currently in the U.S. school system and one who is a first-year Systems Design student, I agree with all your comments having lived them of late. I thought I’d add a few more. Canadians refer to their kids as being in Grade 7, Grade 8, etc., whereas Americans refer to their kids as being in 7th Grade, 8th Grade, etc. This very subtle one took me a few years to notice. Of more significance is the school year, or rather, the cut-off date for the age at which kids start school. In Canada, at least the Canada I grew up in, the cut-off age was December 31st. In the U.S., the cut-off is normally September 1st. So, if you were born in the September to December period, you would have to wait another year before starting school. Two of my kids fall into that category, so my now 18 year-old “December” kid would just now be finishing high school if she had started out in the U.S. instead of being a 1st year at Waterloo. Thanks! Nice to have some insights from an alumnus with first-hand experience. If all of the stereotypes of the typical university experience for American students are to be believed, then I don’t think the legal drinking age acts as much of a deterrent for students! Somewhat related, it seems as if American schools tend to have much stronger party cultures and more school spirit than your average Canadian school (as pointed out by Prof Anderson, this might be due to the prevalence of school sports and fraternities in the U.S.). With respect to admissions, I’ll also add that the American process can be a bit confusing sometimes because some schools have something called “early action” (EA) and still others have “early decision” (ED). For these two, I think you get your response sometime in December (and therefore have to apply by November or so). Early decision is kind of odd because those offers are actually legally binding (you’re obligated to go to the school that accepts you, so you can’t change your mind and choose a different school). So why would anyone go through early decision? It’s because the odds of getting in are higher through ED (because the school knows that you have to commit to them). Could be a tough decisions for some! Also, American admissions have always seemed a bit shady to me. For example, some schools openly admit that they favour legacy applicants and children of donors, and that doesn’t seem like much of a meritocracy to me. Yes, good points. I avoided the whole EA and ED topic because it would just confuse a lot of people. And the legacy admission topic is one I’m aware of but unsure how widespread it actually is in the U.S. for engineering. For us, we’re happy to have children of alumni but they have to get admitted on their own merit. I’ve also been aware of a couple of sibling pairs in Software Engineering at least here. I think I counted 4 recently. Software isn’t old enough to have any parents with children in university yet! Sometimes Americans also talk about “making an A”. First of all, we have number grades (which I think is a bit silly), but even when we do have letter grades I would tend to say “got an A” or “earned an A”. And yes, we do have some frats at Canadian schools (Sigma Chi is highly involved in our community) but nowhere near the level of that at US schools; at MIT and other schools there is a row of fraternity houses on campus. Thanks Prof. Lam. You remind me that I also forgot to mention that there are no private universities in Canada with an engineering program; they are all public (government supported) universities. In the U.S. there are quite a few engineering programs in private universities, like at MIT.